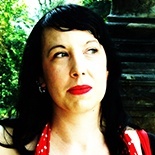 Joanne was born in Pembrokeshire, Wales, and read Anthropology and Archaeology with Social and Political Sciences at St John’s College, Cambridge. Joanne’s first two novels (Orion Children’s Books) are fantastical folklore-infused adventures set in Prague. Puppet Master was critically acclaimed (‘Owen is a terrific storyteller’, The Telegraph; ‘It feels timeless… the genuine article’ The Guardian), nominated for the Carnegie Medal and Branford Boase Award, and translated into several languages. The Alchemist and the Angel was described by the School Librarian as “an imaginative tour de force”. 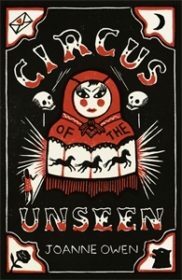 Her third novel, Circus of the Unseen (Hotkey Books) is a contemporary novel for 12+ year-olds that “feels as though Grimm’s Fairy Tales and Eastern European folklore have vividly blended together into a modern yet unique tale.” (www.lovereading4kids.com). 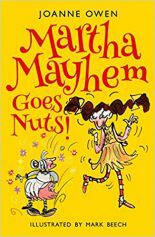 Joanne’s first series for younger readers was launched by Piccadilly Press in 2017, with Martha Mayhem and the Witch from the Ditch and Martha Mayhem Goes Nuts! published to date. 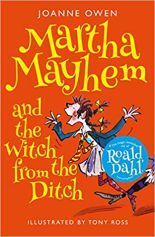 The first book has been shortlisted for the 2018 James Reckitt Hull Children¹s Book Award.